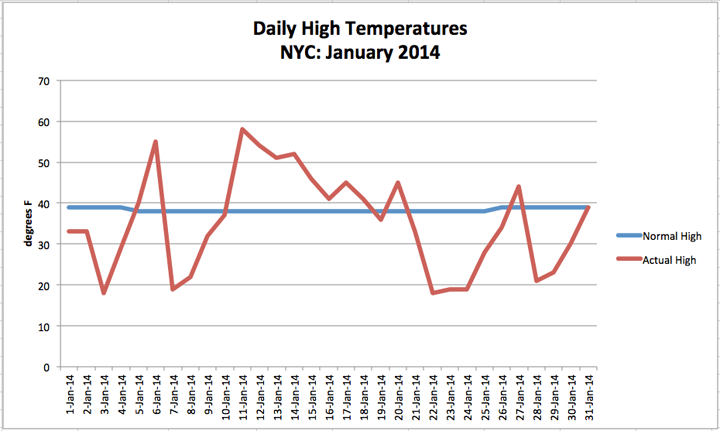 January is typically the coldest month on the calendar for New York City and this year it was brutal. We experienced several arctic outbreaks and saw ice form on the Hudson River. Overall, we had twelve days where our high temperature did not get above freezing. While there were also a few unseasonably warm days, the multiple bouts of extreme cold brought the city’s average monthly temperature down to 28.6°F. That is 4.4°F below normal. In terms of precipitation, the Big Apple was very snowy with 19.7 inches of accumulation recorded in Central Park. On average, January usually brings the city a total of 7 inches of snowfall. According to the NWS, January 2014 is now ranked as NYC’s 8th snowiest January on record. Rainfall, however, was lacking. The city only recieved 2.57 inches, which is 1.08 inches below normal for the month.